No kidding.Â A new drama sympathetic to ‘Dr. Death’ is about to air on HBO. ‘You don’t know Jack.‘ They don’t know how much they don’t know. Kevorkian was recently released from parole after serving over eight years in prison for the second-degree murder of 52-year-old Lou Gherig’s disease sufferer Thomas Youk. Although Kevorkian, 82, said in an interview last year that he was tempted to kill himself in prison, his lawyer talked him out of it; ironically, Kevorkian admitted that he would not have done the same in return. In an interview with CNN’s Anderson Cooper last week, Kevorkian expressed satisfaction with the film, and affirmed that he was still willing to kill despairing people. “I didn’t do it to end the life. I did it to end the suffering the patient is going through. The patient is obviously suffering. What’s a doctor supposed to do, turn his back? 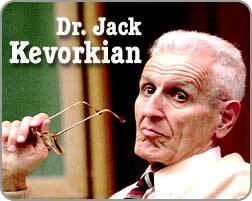 Pro-life activists are blasting the film as a whitewash of Kevorkian’s deeply disturbing career.